QUESTION: Seat position at the canter in an under saddle class… do you have a preference for a 3 point or 2 point/half seat in hunters under saddle? Would you as a judge penalize a rider in a 3 point in the canter assuming their horse accepted their weight and moved and performed beautifully with the rider in this position? Would this rider’s position affect your decision in tie breaker situation? 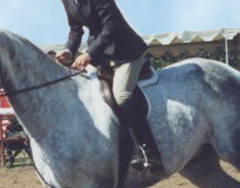 In the Under Saddle classes during the last century, riders sat down in the saddle at the canter in a “3 point” position – three points of contact between the horse and rider being the weight of the seat as well as both the legs. When asked to hand gallop riders rose up to a half seat or “2-point” position, lifting the weight off the horse’s back but still in balance with the horse’s more forward motion. Most riders today adopt this half seat when cantering under saddle. We asked our judges which rider position they prefer when judging an hunter under saddle class.